Geo.tv – England´s Stuart Broad appeals unsuccessfully for a wicket as he bowls on the first day of the second Test cricket match between England and Pakistan at Headingley cricket ground in Leeds, northern England on June 1, 2018. England´s Stuart Broad appeals unsuccessfully for a wicket as he bowls on the first day of the second Test cricket match between England and Pakistan at Headingley cricket ground in Leeds, northern England on June 1, 2018. Photo: AFPLEEDS, United Kingdom: Pakistan slumped to 174 all out after winning the toss on the first day of the second Test against England at Headingley on Friday. But it was bold move given that when England batted first in the first Test at Lord’s, Pakistan had dismissed the home side for 184 to set up a nine-wicket win that put them 1-0 up in this two-match series. 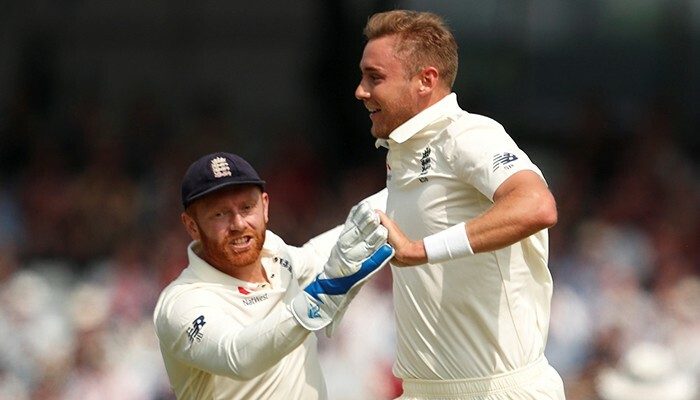 Need to put a strong performance: RootPakistan won the first Test by nine wickets at Lord’s inside four days on Sunday to go 1-0 up in a two-match series but England team captain Joe Root believes the fact his team are back in action so soon will benefit them in Leeds.